At some point before the baby was born I gave up on my idea for a formal living room and decided to make Andrew happy by using the room as a functional space. Part of the reason was that two new couches just weren't in the budget and the one in the family room, the one we use all the time, was showing its age. 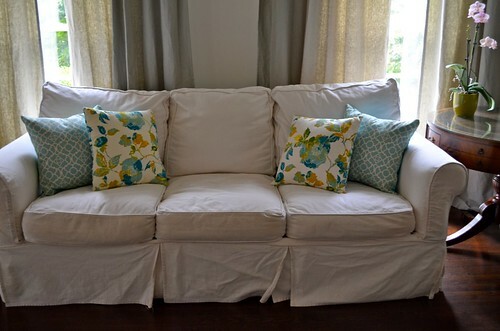 The slipcovered sofa was awesome for a dog and two boys, but it had been through the wash way too many times! I had to replace that one instead of buying a fancy, living room one. So it got relocated to our new "family studio." It has needed new pillows for months and my aim in this room is to make it a little more funky to make it a fun family space. These pillows fit the bill, but they are also not quite "me." 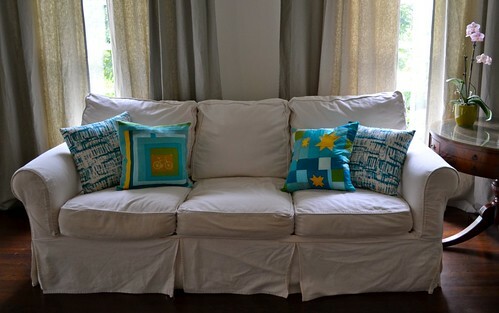 Thank goodness for invisible zippers and now there are two sets of double sided pillows! Funky mix shown above and a bit more refined shown below. The floral/teal painterly design were made from a set of dishtowels from Target. 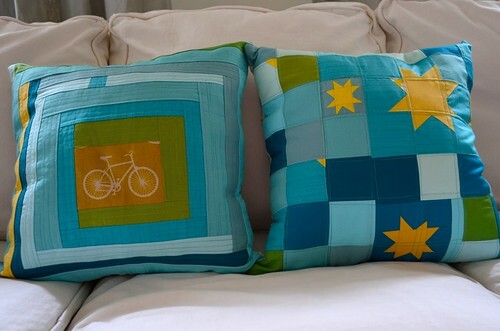 The quilted pillows are various shades of aquas/teals/greens from Kona, plus an echino bike. I made my first invisible zip pillow years ago with Katie's tutorial, and I've made so many it is now second nature. Don't you love when that happens? In other news, the family studio is coming along and is now a nice bright space to work on a project, check email or cozy up with a book. I have a few more smallish things to do and then I'll show you the whole thing. I hope you are enjoying summer! We are trying to soak it all in while we still can! That is clever! And they're gorgeous! Love your colors. And what a great idea - fun & funky on one side; refined on the other...GENIUS! And using dishtowels is another great idea, too!